Location/ Directions: From I-35 North or South: Take exit 297 Midway Drive; Southbound travelers make U turn to service road for approx .2 miles hotel on the right; Northbound travelers stay on service road through stop lights for approx .2 miles, hotel on the right. About Hotel: 4-Floors, 99-Rooms, Interior Corridors, Business Center, Health and Fitness Center (On-site), Standard Internet Service, Outdoor Pool, On-site Guest Self-Laundry Facilities (washer/dryer), Daily Housekeeping, Dedicated Lounge, Ice Machine, Color Cable / Satellite TV, Work Desk w/ Lamp, Speakerphone with Voice Mail, Hairdryer, Private Bathroom, Coffee Maker, Microwave Oven, Connecting Rooms, Double Glazed Windows, Individually Controlled Air Conditioning, Iron / Ironing Board, Rollaway Bed/Cot (Fee), Separate Hanging Closet, All rooms non smoking, No Pets Allowed. Railroad View: Expect a fair to view across Interstate 35. Some buildings & trees will block some of the view, but there should be some clear areas as well. High floor room will always improve the railroad view from this hotel. Railroads past Hotel: BNSF Railway, former Santa Fe Railway line runs east-west Temple to Brownsville, TX and beyond. Notes: While in town, be sure to visit the Temple Railroad & Heritage Museum located at the Amtrak train station downtown. 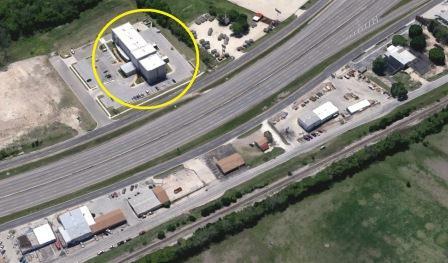 Photo Comment: The Google Aerial view shows the Holiday Inn hotel circled in yellow. The single track railroad is seen along the tree line in the lower area of the photo.